 Are Adventure Bikes being used for the purpose they were designed for? A few weeks ago we published a story titled “Are Adventure Riders The New SUV Driving Soccer Moms?” The story was a reaction to a general perception that most Adventure Bike owners never use their Adventure Bikes off-road. Is the perception true? Where is the data to support this generalization? We created an online survey that would help us discover the truth about how Adventure Riders actually use their bikes. The results have been tallied and here’s what our survey reveals. The first question shows what types of bikes respondents are riding. The survey was filled out primarily by owners of Adventure Bikes that are 650cc or greater. Very few of the respondents ride small dual sport bikes that could have skewed the results more towards off-road use. The greatest number of participants ride liter-class Adventure Bikes, which we would expect to skew the results more towards street use. The results of the second question were surprising. 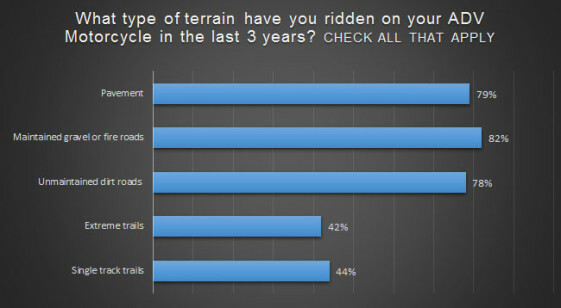 The survey showed 99% of participants ride some type of off-road terrain. Over half said they ride 25 days or more off-road each year on average. That’s a lot of dirt! The third question reveals the type of off-road terrain respondents ride. Respondents were able to select all the different types of terrain they typically ride. The results show 82% of our participants are riding off-road on at least maintained gravel or dirt roads. We were surprised to see that almost as many are riding on more aggressive unmaintained dirt roads. A large number of respondents are riding on more extreme trails and single track as well. 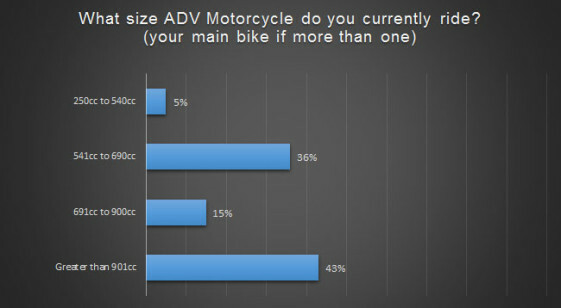 Although most of these respondents were owners of smaller Adventure Bikes. 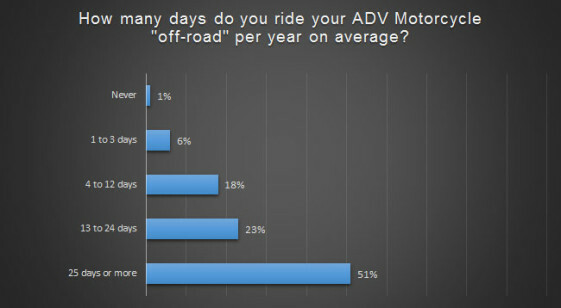 The results of this survey contradict the stereotype of Adventure Bikes not getting used for their intended purpose. The number of Adventure Riders that use their bikes off-road was even higher than we expected. Possibly there were more off-road oriented Adventure Bike owners that felt compelled to answer the survey than street oriented riders. But even if the survey is slightly skewed, the numbers show an overwhelming majority of Adventure Riders use their bikes off-road. 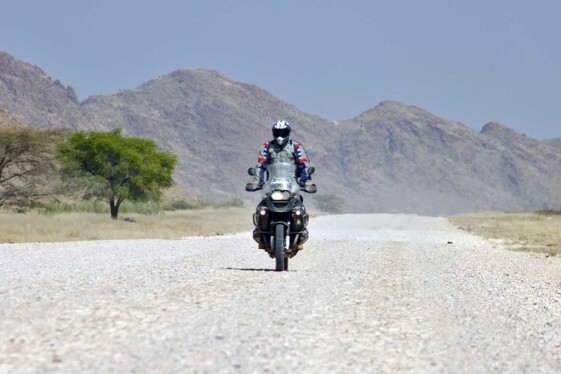 Results showed even riders of large Adventure Bikes are spending significant time in the dirt. Adventure Bikes are comfortable and versatile motorcycles that make great street bikes. They can be just as much fun on a twisty asphalt road as they are on a trail. No one should be judged for how they choose to use their Adventure Bike. But if this stereotype about how “most” Adventure Riders use their machines persists, it could influence the design direction of future models. We’ve already seen it happen to SUV’s. They started out as lighter, rugged, off-road capable vehicles. Over the years more luxuries were added until they became too bloated and heavy to be of much use off-road. The same trend toward more expensive, heavier, less off-road capable Adventure Bikes seems to be taking shape in our own industry. Fast forward five years from now and the Adventure Touring segment could suffer the same fate as the SUV. It’s important that we let our voice be heard so that Adventure Bikes are designed around how we actually ride and not based on a stereotype.  Are Adventure Riders The New SUV Driving Soccer Moms? Rob Dabney, consider this a personal invitation from me, the GS Queen, to check out the GS Giants on FB and on the web at gsgiants.com. We go big! Hey Tracy. Thanks for the invitation. The GS Giants are a fantastic group. The Big GS’s are great off-road bikes for their size. Let’s hope BMW continues making off-road capable ADV bikes well into the future. I like all the ADV bikes. BUT. The big ADV bikes can only Dream about where I take my 07 KLR 650. It all depends on how you intend to use the bike. For me the smaller bikes make more sense. I really hope ADV bikes don’t get any bigger than they are. A trend towards bigger and bigger ADV bikes leaves people that also want to use them for off-road riding with fewer options. Great results, and certainly consistent with my personal usage. Regarding the concern about Adventure bikes getting “too big”, it might be valid. My (admittedly biased) criteria for a new generation of Adventure bikes would be those with increased range (better fuel economy and larger tanks), more cargo capacity without adding weight (durable and intelligent pannier and top-box designs and materials), weight reductions (without giving up power), improved lighting, and engineering for simpler, DIY maintenance that minimizes maintenance times and tear-down efforts! Great survey, keep up the useful articles. Thanks for the feedback Robert. Glad you are enjoying the content. Your criteria sounds like the perfect ADV bike! Great survey! I hope this forum is heard by the bike makers. I visit your site on regular basis. There are not so many great dedicated web sites out there like yours. Keep up the good work. FYI I did a single track yesterday intended for BMX only with my R1200GS Adventure yesterday, I do at least 10-20km off road tracks every weekend (I live in Dubai) same as I do long trips of 1000km or more on weekends too. The fact is I ride the GS for It’s multiple capabilities any other sort of bike won’t do it for me. Thanks for the kind words Hadi! That’s impressive that you are riding your R1200GS on a BMX course. They are definitely nimble off-road for their size. Post some video if you have it on our Facebook page! Thanks for the hard work. You had an impressive amount of responses to your survey, and from all over the World, too! I’m hoping that Adventure bikes 5 years from now look more and more like Dakar rally replicas, instead of becoming Cruisers… with a beak! More variety is always good. Let’s hope the manufacturers are listening. The ADV segment is booming right now, so this should spur more of the mfg’s to take risks on enthusiast bikes. We’ll have to reward them if they do with sales, so there is an incentive to continue. Thanks for the kind words Chopperbob! I’ll stick with the smaller bikes too. My DR650 is as big as I would want to go for anything resembling real off-road use. My V-Strom, at about 100 lbs heavier, is just too heavy for anything other than gravel roads or very easy two-track. I think part of the reason for the misconception about where most people ride ADV bikes is simply because the paved roads are where everyone is and that’s where they’re seen. This is why marketing analysis exists. This survey means little considering that most so called adventure riders that own a 900 cc or greater bike, would answer “yes” to the off road question obviously because they don’t want to look like a poser. Especially if they spent upwards of 20 to 30 grand on a bike and a Ewan and Charlie costume.